I find that when I look at the "trees" rather than looking at the "forest", it is easy to come up with myopic definitions that will lack meaning or be confusing when we step back to view the overall context. I think many of our contradictory views are perhaps because each of is standing a different distance from the trees. I have taken the liberty of configuring a "Big Picture Approach" with teh objective of getting things in perspective. I think it is important that we be able to distinguish between "Neutral CO2" that is derived from biomass, and "Fossil CO2" that is derived from fossil fuels. 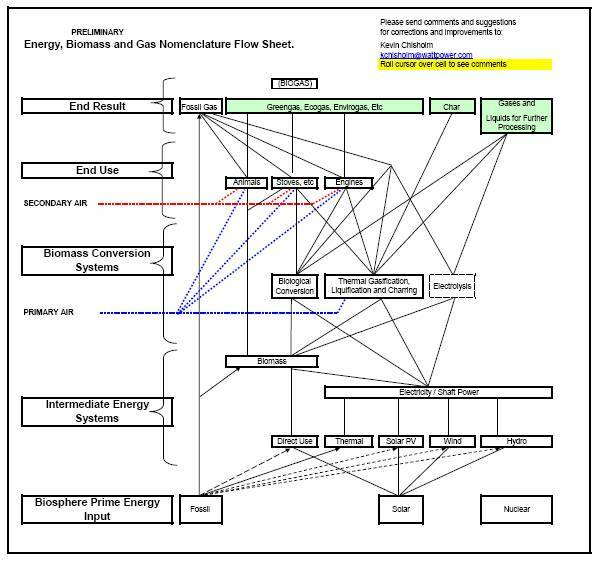 In the attached preliminary draft of a "Energy, Biomass, Gas and Nomenclature Flow Sheet" I attempt to lay things out "from start to finish". There are probably many opportunities for improved clarity, additions, etc. I would propose that if we first get "the big picture" right, then detailed definition of process and nomenclature will flow relatively easy.